High Quality BRASS Cup from Bazar de Magic Beautiful Exclusive Deception Design. Heavier and Larger Loading Capacity than Regular Cups. Hand spun highly polished metal cup, the gimmick spun in to defy the closest examination. Make the Ball disappear and return to the cup, then it changes to an orange! Supplied in a Box with Color Label Box Perfectly Spun Cups! Crocheted Balls! Large Load Size! Cloth Carrying Bag! Great Instructions & Routines! Cup measures 3.25 inches tall and 2.75 inches in diameter at the mouth. This product was added to our catalog on Saturday 05 June, 2004. High Quality BRASS Cup from Bazar de Magic Beautiful Exclusive Deception Design. Heavier and Larger Loading Capacity than Regular Cups. 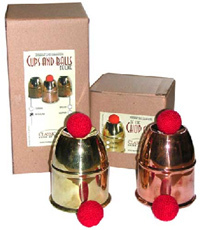 Hand spun highly polished metal cup, the gimmick spun in to defy the closest examination. Make the Ball disappear and return to the cup, then it changes to an orange! Supplied in a Box with Color Label Box Perfectly Spun Cups! Crocheted Balls! Large Load Size! Cloth Carrying Bag! Great Instructions & Routines! Cup measures 3.25 inches tall and 2.75 inches in diameter at the mouth.